Volunteer. Donate. Raise Awareness. Share the facts. Stop the Clot! We’re frequently asked to help people understand the best way to get involved with the work of the National Blood Clot Alliance, a nonprofit voluntary heath agency focused on increasing awareness about life-threatening blood clots and providing information and other educational resources to individuals to help them be their own best advocates with their healthcare providers. Below are a number of different ways that you can get involved, with immediate next steps you can take to answer the call and start volunteering today. If you have any questions about the information outlined below, please contact info@stoptheclot.org. If you are interested in finding out how you can volunteer to help NBCA, please fill out this Volunteer Interest Questionnaire. Read our 2017 mid-year Impact Report here. Our mission is supported, in part, by funds raised with the help of individuals just like you. Help us make a difference and raise funds to support our mission during March 2017 — Blood Clot Awareness Month (BCAM) — by sharing your blood clot story. 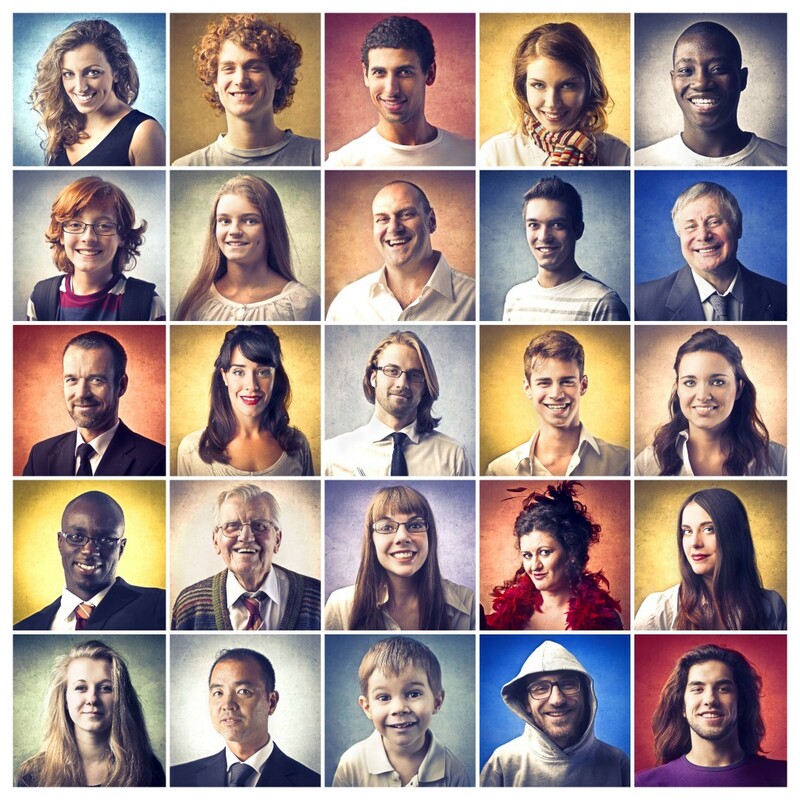 Blood clots can and do affect anyone, from all backgrounds and walks of life. 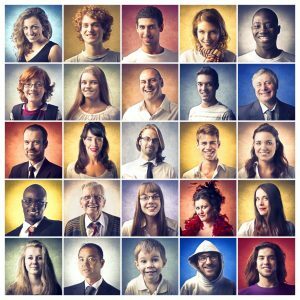 With your help, NBCA would like to showcase the many stories – or faces – of blood clots on CrowdRise. We invite you to share your story with us and become part of the “Faces of Blood Clots” team, which involves weekly updates and fundraising tips to help you raise funds for NBCA. At the end of the month, the person who raises the most money will win a prize from NBCA. Awareness leads to prevention. Please consider sharing your story with us as a part of this competition during our awareness month. If you would like to be a part of this fundraising campaign, or have questions, please e-mail Tarin Patrikis at tpatrikis@stoptheclot.org. 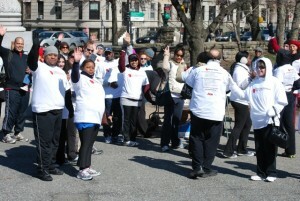 There’s no better way to help than by organizing a Walk to Stop the Clot or other fundraising event in your neighborhood. You’ll meet wonderful people all coming out to get involved in a common cause. We encourage and applaud your enthusiasm and involvement, and we’ll help you get started and on your way. For more information, contact Tarin Patrikis. Also, you can visit our CrowdRise page and click on the black “fundraise for this charity” button at the top, to start your own event or to support an existing one. Another fundraising option for you is our Team Stop the Clot program, where you raise funds and awareness through your participation in any race you choose – be it a local 5k road race, a half-marathon, a marathon, a triathlon, or even an Ironman. Commit to help NBCA spread the word about the danger of blood clots. Take about five minutes to set up your own fundraising page where you can share your reasons for supporting the National Blood Clot Alliance and let your family and friends know all about it. You’ll be glad you did! AmazonSmile is a simple and automatic way for you to support the National Blood Clot Alliance every time you shop, at no cost to you. When you shop at smile.amazon.com, you’ll find the exact same low prices, vast selection, and convenient shopping experience as found on Amazon.com, but with the added bonus that Amazon will donate a portion of the purchase price to NBCA. Simply go to your account settings at Amazon, register for AmazonSmile, and make the National Blood Clot Alliance your Charity of Choice. Get step-by-step directions here. Your support, as always, is genuinely appreciated. If you or a loved one have been affected by blood clots, we want to hear from you. You can share your story on NBCA’s website, and help others learn from your experience. Information to help you get started, and the required steps to submit your story to NBCA, are found here: Guidelines for Story Submission. You also can connect with others affected by blood clots, by becoming a member of NBCA’s online support and discussion community. The National Blood Clot Alliance online support community is an online resource, powered by Inspire, that provides a safe and supportive space for people affected by blood clots and clotting disorders to gather, share their stories, and interact with other members. Perhaps, most importantly, our Stop the Clot(R) support community is a place where you can both inspire and be inspired. One of the best ways you can help build awareness is by sharing NBCA resources with your friends, family, and personal network of social media contacts. Start with an emphasis on risks, and signs and symptoms, and then you can work with other resources on NBCA’s website to share and get the word out. 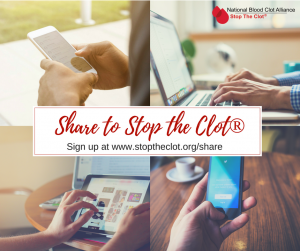 Sign up for NBCA’s social sharing initiative Share to Stop the Clot® and start sharing life-saving information today. By signing up, you’ll gain access to information that can easily be shared on your own social media channels, and you will be among the first to receive new information about NBCA’s programs and services. Sign up here.